WP Meta SEO gives you control over all the important SEO criteria for WordPress, such as the metadata, images and links. In one view you will be able to add metadata, alternate tags and resize photos. The plugin also has the most advanced 404 and redirect manager for WordPress. WP Meta SEO is composed of a free version, available in the plugin directory, and a paid one - an addon that contains additional themes and configuration. In order to install our plugin, you should use the standard WordPress installer, or unzip and put everything in the folder in /wp-content/plugin. The free version is available in the plugin directory and can be installed through the WordPress administration panel. Then click on activate plugin to see WP Meta SEO menu appear in WordPress' left menu. The PRO ADDON needs to be purchased and downloaded from JoomUnited. To install, download the zip package from your account (My account menu) and install it using the zip uploader: Plugin > Add new > Upload plugin. Click on activate plugin to get all additional features activated. In order to update WP Meta SEO, you can use WordPress' default updater. You can also remove and install the new version from a .zip file downloaded from www.joomunited.com. In any case, you won’t lose any content because everything is stored in the database. Be sure to always have the latest version to avoid security and stability problems. To update the paid version, you need to login to your JoomUnited account from the WordPress settings: Settings > General. Then use your JoomUnited account login and password. After a successful login, the button turns to blue with the text Disconnect my JoomUnited account. Finally, you can update all the JoomUnited commercial plugins from WordPress' standard updater. The meta data are read by search engine only and allows you to define specific content attached to a page, a post or any other content. The details can be displayed in search results if the search engine find them accurate enough, with special consideration for the meta description. If not, the search engine will generate its own meta description. Nonetheless, some secondary search engines (not Google) still use metadata to index your content. Meta information is editable from your content, in bulk (next chapter) or as a setting for the home page. So open any type of content (a post, page or any other custom post type) and check at the bottom of the page. You'll get a snippet preview of the search engine result. The meta title and description should be filled here, respecting the maximum number of characters. Tip: you don't need to fill 100% of the meta info if you don't have time for it - it's important but not mandatory in SEO. We recommend to, at least, fill all the metadata on the most important pages that you have with a catchy text. On the left menu, click on Content meta to access the bulk meta editor. You'll get access to the meta bulk editing table. All your WordPress content, posts, pages or custom post types (such as WooCommerce products, events and so on) are listed in this area. Meta titles need to be shorter than 70 characters, and meta description shorter than 320 characters to be fully displayed in Google, Bing and Yahoo. All the descriptions you add will be saved using AJAX. On the top left part you'll find a filter to display or hide some of your content. You also have the option to bulk copy all the content titles as meta titles. It's not 100% recommended to copy the content title as the meta title - the meta title should be more catchy as it's displayed in search engines' results, but you can save some time with it! Finally, at the top, you have a search engine to filter your content faster. From the global settings of the plugin you can also enable an option to set your content to follow or no follow, and whether to use an index. Follow / no follow provides a way for webmasters to tell search engines: don't follow this link. Intuitively, it may influence the link target’s ranking. Index / no index allows search engines robots to index content. By default your content is indexed. Once the option is activated, you can use it from the page SEO editor as well as from the bulk editor. From the bulk editor and your dashboard, you can also check for duplicate meta titles and descriptions. WP Meta SEO is compatible with custom post types, which means that you can edit all your third party meta content. A search filter is available on the top left part of your screen. For example, if WooCommerce plugin is installed you can see products available in the list and edit meta from product pages too. In order to use this feature, you need to activate the Meta keywords option in Settings > General. Once enabled, you can add meta keywords for categories and content. Alternatively, you can insert meta keywords in the content's metadata. This feature helps you identify the keywords that matter most for your content by integrating with the Google Search Console. It automatically detects and suggests effective keywords that are related to the content that you’re discussing. For example if the expression "Google Drive" is used often in a post and you have also added the expression "Google Drive Cloud" to the search console, the keyword will be highlighted. Inside your content, in the SEO onpage block you have a tab named "Social For Search Engine". From this tab, in each content, you can setup information that will be displayed when a user shares your page on Facebook or Twitter. You can define the title, description and image. Images also have editable information to improve SEO. We recommend to use both alternative text and image titles. The main advantage is that it helps search engines discover your images and display them in image search results. Plus, these tags improve the accessibility of your site and give more information about your images. Use our bulk image tool to quickly check and fix that, use the left menu's Image Editor to access the image information. File name, is the physical name of your image on the server. Note that this editor won’t break any image link - they are dynamically replaced in your content. The legend is the WordPress native legend feature included by default in WordPress. Note that the legend is displayed in your content for your visitors. Tip: all of this, except for image file names, can be edited from the WordPress image manager. For a more effective workflow on images we recommend our WP Media Folder plugin. When title or alternative text is reported as missing, you'll get a fix meta button that opens a lightbox to fill the missing data. You can make a quick copy of the image name or of the image's alternative text. 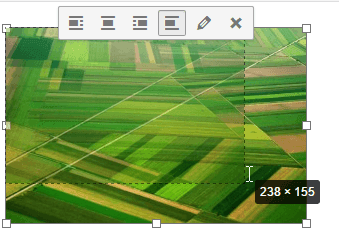 WP Meta SEO also has a tool to fix images that have been resized with handles (prevent HTML resizing). This is something that search engines would consider as an error in your page because images will look poorly. Moreover, it slows down the page loading times by loading a big image to display it at a smaller size. Most of the time it comes from editors that use handles to resize images directly in the content. Our plugin is able to detect this and fix it right in your content by regenerating a new proper image size. Every time you see the button "Resize image", you can resize the image. You can see that in this case you’ll reduce 30% of the file size. A Replace all button is also available because the image can be available in a lot of posts or pages, allowing you to perform a bulk replacement! Finally, the Meta Bulk Actions button on the top left area includes bulk actions: Copy image name as Alt text, Copy image name as Image title and Copy image name as Image description. You can execute a bulk action on a selection of images or on the entire set of images. To filter only the images that requires optimization, you can use the top left control to display only: images with missing information or HTML-resized images. In the top right part are filters to display only Internal broken links, 404 automatically indexed, Custom redirect URL, valid URLs and Not yet redirected. The second filter is maybe the most used as it allows you to filter URLS by their redirection status. To quickly display your 404 errors from your website use the filter "Not yet redirected"
The Type filter allows you to filter 404 errors by media type: URL due to an image, a normal URL, or any other file (including zip, PDF, and other file types). To index or re-index all the 404 errors from your content (any page, post or custom post type) use the button "Index Internal Broken Links". Upon clicking, you get a progress bar above the button that gives feedback on the process. If you have a large amount of data it may take time but it won't stop. On the right side of the URL filter you also get a flush button. Why is that? your website content can change and you could have, for example, removed a lot of content or fixed a bunch of 404 errors in your content. The flush tool removes all the 404 URLs that were indexed, whether internal and external, except the ones that you've already redirected. When you click on Redirect, an interface pops up to add a redirect URL - just insert the new link and click "Update". From the plugin settings you also have the option to redirect all 404 errors to the home page. This is not a perfect solution for the user experience, but it may help in case of emergency. The WP Meta SEO ADDON, you can add Custom URL or create redirect rules. In the top left part of the interface is Add Custom URL Or Rule button. You can create custom redirects with the 301, 302 or 307 status codes. Or creating the redirect rules to make a redirection of an URL set. For example, redirect all the blog posts identified by the URL /blog/* to a new URL. Tip: a good 404 page can really helps users! Don't forget that you can add key links and even a search engine to your 404 page. 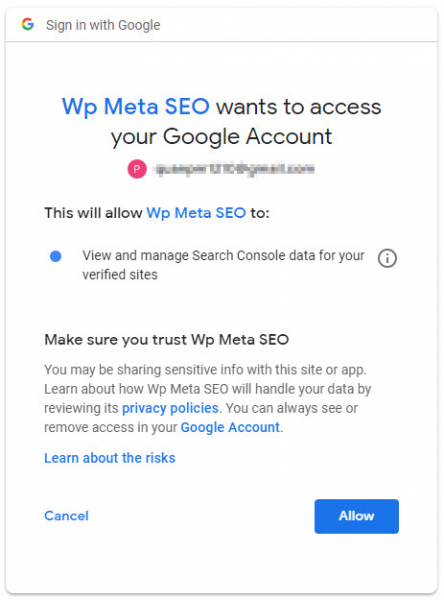 WP Meta SEO ADDON allows you to authenticate the Google Search Console to get and redirect the 404 URLs indexed by Google. Click on the left menu's Search Console option. You can use your own Google Developer App credentials, or just get a token by clicking the Get Google Authorization Code button. Alternatively, you can fill in the fields with your own Google ID and Google Secret if you already have them. From the prompt, validate the Google authorization screen and copy the token in the appropriate field. You're done! You can now import the Google Search URLs list. For each URL you can add a redirect like with any other URL. The Mark as fixed option will mark the URL as fixed in the Google Search Console. WP Meta SEO comes with a tool that generates XML sitemaps and HTML sitemaps. The main purpose of the XML sitemaps is for them to be added to the Google Search Console in order to index pages faster and better. Access the sitemap tool using the "Sitemap" menu. Then you will get the configuration screen and several tabs to select the content you want to add in your sitemap. To select a sitemap source, navigate through the tabs and check the menu, sub-menus, post or page that you want. For the HTML sitemap you also have an option to select the number of columns that you want to display in your sitemap menus, posts or pages. If you update any content, you need to click the Regenerate and save sitemaps button to update your sitemaps. The plugin addon also comes with some additional themes: Accordion layout and tabbed layouts. WP Meta SEO gives the possibility to automatically send your XML sitemap to the Google Search Console. Click on the link above the Save and regenerate sitemap or use the left menu Search Console. You can use your own Google Developer App credentials or get a token by clicking the Get Google Authorization Code button. Then confirm the details in the Google authorization screen, and copy the token in the appropriate field. You're done! Each time you click the save button from the sitemap management interface, the sitemap will be re-submitted to Google Search Console. If you've got a subscription for the WP Meta SEO Addon, you can also check your sitemap links with the sitemap checker tool. After clicking the button, the list of URLs will be displayed on your screen. The result is an AJAX-powered list of pages that are present in the sitemap with their status and other information. You can sort by different columns to focus on a specific group, and subsequently fix any problems. The link title attribute does not have any SEO value for links. However, link titles can influence click behavior for users, which may indirectly affect your SEO performance. Link titles can be added either from the content, or from the bulk editor interface, from the "Link editor" menu. WP Meta SEO is fully integrated with Google Analytics. You can activate the tracking and display the Google Analytics data from the WordPress admin. First, you have to get an Access code to use the Google Analytics Report. Then perform the following steps to get the Access Code. A new tab will be opened. Paste the code to the WP Meta SEO textbox and click Allow, and then click the Save Changes button. Finally you need to select the Google Analytics property corresponding to your domain. OPTIONAL: If you want to use your own API, fill your Client ID and Client Secret and save changes. Tracking type: Classic Analytics and Universal Analytics. Anonymize IPs while tracking: allow you to comply with some privacy protection laws available in different countries. Enable demographics and interests reports: display remarketing, demographics and interests reports with Google Analytics. This feature allows you to track downloads, mails, affiliates and outbound links. Depending on your needs, you can choose to include or exclude these actions from the bounce-rate calculations. This option is used to ignore traffic generated by certain logged-in users. Congratulations! Google Analytics is now connected and you can get data from it. WP Meta SEO ADDON comes with an email report feature that allows you to send SEO email reports to you, your client, a marketing team or just about anyone else! The reports includes: website SEO data, Google Analytics data and custom content. To access to the Email report management, use the left menu: WP Meta SEO > Email Report. The next settings are about the content you want to add in your report, mainly Google Analytics views or WP Meta SEO data. You can add Google Analytics data by Page views, Traffic, Users and so on in periods of 7 days, 30 days, One year and others. You can add or remove several Google Analytics views from your report. Once you hit Save Report, your configuration will be saved and you can then send a single or automatic scheduled reports. You also have the possibility to attach the report to the email as a PDF. Post/Page index: to say to search engine: hey! Do not index this content! On the second tab you got redirection-related settings. Finally, the Breadcrumb is helpful for user navigation and also really appreciated by search engine when it’s well implemented. WP Meta SEO includes a breadcrumb generator with rich snippet compatibility, separator and text customization, link activation, shortcode and PHP code generation. Home text: If home is included, you may want to force some text content. By default it's the content title. Clickable breadcrumb: The breadcrumb element can be clickable or not. PHP Shortcode: Generate breadcrumb navigation based on your categories or page levels. The shortcode can be included in theme layouts. WordPress Shortcode: Generate breadcrumb navigation based on your categories or page levels. The WordPress shortcode can be called anywhere in your content. This feature is available in the Addon - it is an optional configuration to send email reports with another configuration from WordPress' default send mail functionality. In Wp Meta SEO addon, you've got additional settings to polish your business’ appearance in Google’s search results using the search engine’s Local Business structured data. To update your information, just navigate to the local business tab, insert the relevant data and save your changes. The update will be effective in a few days (it takes around 2 days). Your business information will be displayed in search results. If some information is not relevant, like the price range, for example, just don't fill that information and it'll still work. We've added the service in the WP Meta SEO Settings > Image Compression because we consider it's a big performance improvement but it's not mandatory to use it. Our members can get a 20% OFF coupon on all membership from the configuration page. After installing, you can compress the image and pdf files at left menu Media > ImageRecycle.